It’s the perfect solution to an age-old problem. At any pub in the world, there’s one constant menu item. Everybody makes fish and chips. However, that’s also the problem, because since everyone makes fish and chips, everyone has a different idea about how they should be. Some like soggy, some like crisp, some like vinegar, and some don’t. Before now, if you liked vinegar, you were stuck with soggy, but that’s no longer the case. The American company J&D’s has invented Malt Salt, which is powdered, vinegar-flavored salt! It’s the best of both worlds! If the name J&D’s sounds familiar to you, that’s because it is. They’ve been the subject of a PopFi article before, when they invented bacon-flavored popcorn. Now they’re back and more creative than ever, with the perfect solution to my particular fish-based issue. 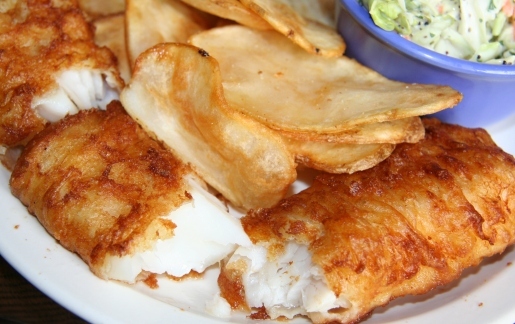 I love adding vinegar to my fish and chips, but I hate the sogginess. Now there’s a solution, and I’d love to try this if they’d be interested in sending me a free sample.